The premium light-curing resins in the GR-series cover the a wide range of additive manufacturing applications for audiology, dental, engineering, and others. These products are specifically tailored for 3D printers using the image projection method (DLP: Digital Light Processing). 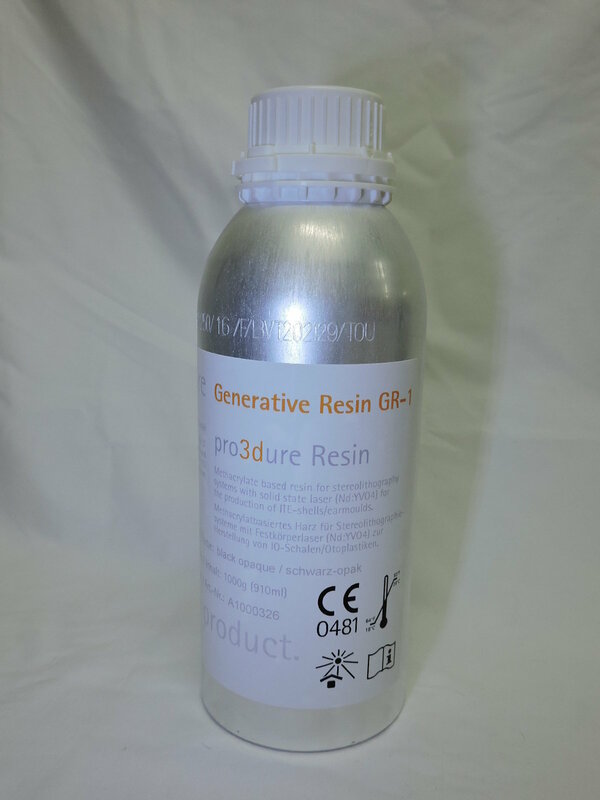 The Pro3dure GR-1 Black Opaque resin is a low viscosity, bio-compatible, black resin based on (meth) acrylate for the preparation of audiology components and many other applications where bio-compatibility is important. GR-1 Black Opaque works very well at wavelengths between 365 and 405nm. This material is characterised by its exceptional UV resistance strength, and a high elongation at break. GR-1 Black guarantees high process robustness without brittleness and meets the highest standards of aesthetics. Parts made from pro3dure GR-1 Black can be sterilised with ethylene oxide, gamma radiation or steam. They remain dimensionally stable and virtually free from discoloration.